Christmas Ornaments Made in USA - Made In America Ornament - A Christmas Ornament Co.
America has long been the leader in the manufacturing of durable goods, as well as being at the forefront of industrial, agricultural, and technological innovation. 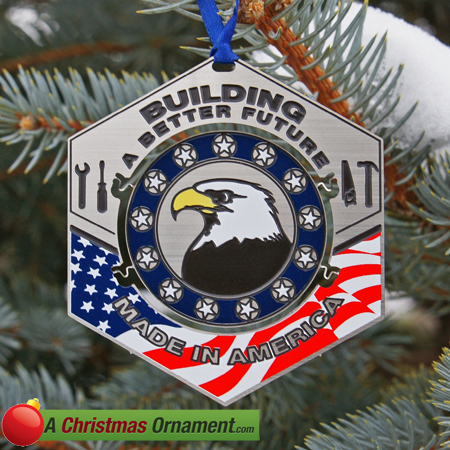 The staff at A Christmas Ornament has created an ornament that celebrates American ingenuity and know-how: our first in a series of "Made in America" ornaments is the result of many hours of design and is manufactured to exacting specifications. Formed in the shape of a hexagonal bolt surrounded by 13 ball bearing stars and framing a bald eagle, this ornament is symbolic of American manufacturing’s “can-do” work ethic and also features tools used everyday by America’s trade-workers: a wrench, screwdriver, saw and hammer. Americans have been manufacturing high-quality goods for hundreds of years and the tradition continues today with this American made ornament. Makes an excellent addition to any Christmas tree so others will know you support “Made in America.” Created from brushed nickel and stainless steel and assembled in West Virginia, all aspects of the finished product are American sourced. We want to restore pride in American craftsmanship while simultaneously making our items affordable to everyone.